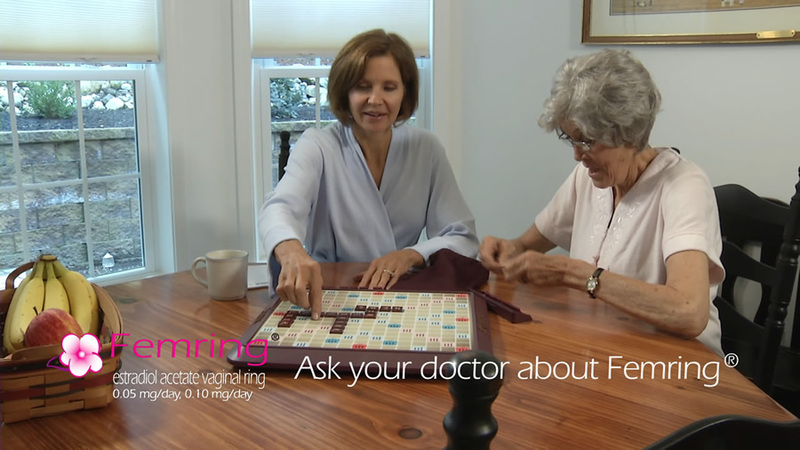 An ad agency client retained tvStudio.com to collaborate on a “how to” video for a hormone replacement drug for women. Ultimately, the project illustrates our ability to handle complex projects from concept to completion, from storyboarding and scripting, to casting, to filming on location and producing a finished product. The client wanted to show a busy woman in her 50s, working, taking care of her mom, and going about her day-to-day life. The desire to show a home environment necessitated that we shoot on location. The client also wanted an existing animation to be incorporated into the video. Working with an ad agency brings with it the involvement of many people, and the necessity of multi-layer approvals (often including legal). tvStudio.com secured the use of a suburban home for filming this project. We completed a site survey prior to the shoot, which enabled us to successfully plan for arriving, moving furniture to accommodate our equipment, setting up and filming, and returning the space to normal within our allotted time. During production, we not only incorporated the required animation but used it as a theme throughout the video. As we completed new versions of the rough cuts, we encoded them as WMVs and uploaded them to our secure server. This allowed access and viewing by the many decision makers involved, which in turn made it easy for their project manager to quickly communicate suggestions and changes to our editor. This project provides an excellent example of how tvStudio.com can serve as a seamless extension of services for an ad agency, and how a project can come together beautifully by combining the talents of their people and ours. In the end, the client was delighted with the finished product, which came in on time and on budget.